In June we were welcomed to the Whittington Hospital for a day on breathlessness. We were joined by colleagues including respiratory specialist nurses, physiotherapists, specialist pharmacists, members of NHS England and a doctor from the Netherlands. A big tick in the multidisciplinary team curriculum box! Breathlessness vs respiratory failure: what matters to patients and respiratory clinicians? Abidov, Aiden, et al. “Prognostic significance of dyspnea in patients referred for cardiac stress testing.” New England Journal of Medicine 353.18 (2005): 1889-1898. This study found a x2 risk of dying in those who were breathless and had known CAD, and a x4 risk of dying in those who were breathless and ddid not have CAD. Lange, Peter, et al. “Prevalence of night-time dyspnoea in COPD and its implications for prognosis.” European Respiratory Journal 43.6 (2014): 1590-1598. Dr Myra Stern took us through some case studies, and encouraged us to think twice before reaching for the steroids every time we saw a COPD patient with breathlessness. She questioned the evidence for benefit and reminded us of the treatments in COPD with good evidence: smoking cessation, pulmonary rehabilitation and LTOT. NICE guidelines recommend 30mg prednisolone for 7-14 days as a rescue pack, startted on the basis of a change in symptoms as part of a self-management programme. The problem is for those patients who end up on multiple courses of steroids with no clear benefit, and then who are unable to wean off. The question of whether we are underdiagnosing adrenal insufficiency proved difficult to answer. According to endocrinologist advice a SST can be done if a patient is on less than 10mg pred a day or less. Remember the daily doses of inhaled cortcosteroids that may lead to adrenal suppression: 800mcg beclomethasone, 400mcg fluticasone. In addition there is the risk of diabetes and osteoporosis with high dose oral or inhaled steroids. 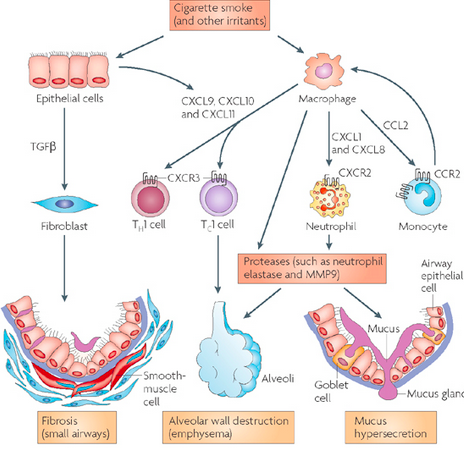 We were encouraged to review the pathogenesis of COPD vs asthma, and consider why steroids are likely to be effective at suppressing inflammation in asthma, but not in COPD. Barnes, Peter J. 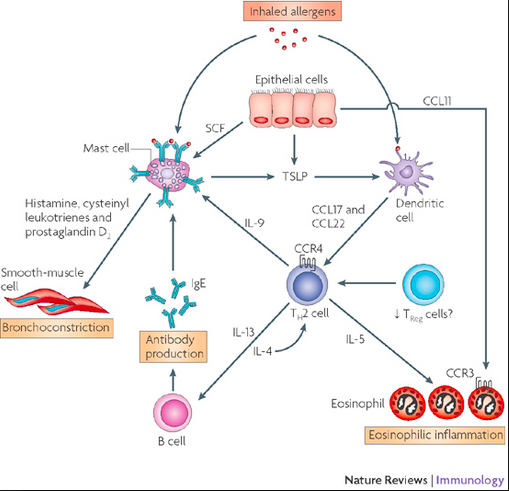 “Immunology of asthma and chronic obstructive pulmonary disease.” Nature Reviews Immunology 8.3 (2008): 183-192. Asthma vs COPD immunology Experiments have shown that inhaled steroids have no anti-inflammatory action in stable COPD (specifically no change in IL-8 levels, sputum supernatant elastase activity, matrix metalloproteinase (MMP)-1, MMP-9, and the antiproteases secretory leukoprotease inhibitor (SLPI) and tissue inhibitor of metalloproteinase (TIMP)-1 in this case. Culpitt, Sarah V., et al. “Effect of high dose inhaled steroid on cells, cytokines, and proteases in induced sputum in chronic obstructive pulmonary disease.” American journal of respiratory and critical care medicine 160.5 (1999): 1635-1639. Editorials discussing several studies: Burge, P. Sherwood. 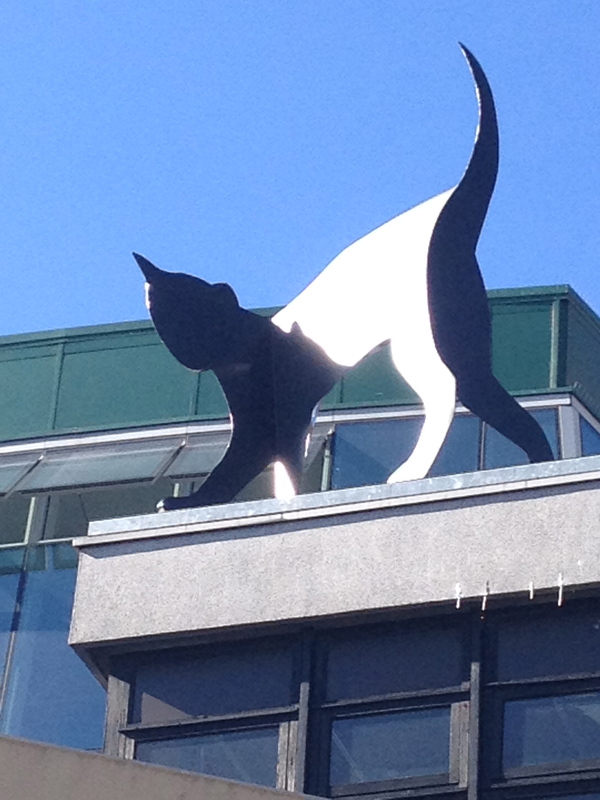 “EUROSCOP, ISOLDE and the Copenhagen city lung study.” Thorax 54.4 (1999): 287-288. EUROSCOP: Watson, L., et al. “Predictors of lung function and its decline in mild to moderate COPD in association with gender: results from the Euroscop study.”Respiratory medicine 100.4 (2006): 746-753. ISOLDE: Burge, P. Sherwood, et al. “Prednisolone response in patients with chronic obstructive pulmonary disease: results from the ISOLDE study.” Thorax 58.8 (2003): 654-658. TORCH showed a 25% reduction in exacerbations with combined therapy, but not on the rate of severe exacerbations requiring hospitalisation, compared with salmeterol. No effect on mortality. NICE recommends combination therapy in those with 2+ exacerbations per year and severe disease (<50% predicted). This should be around 10% of patients, but a much greater proportion get given corticosteroids. It is important to remember that Seretide 250 is the single most expensive drug for the NHS, and 3 of the the top 5 drug costs were all Respiratory inhalers in 2011. More recent evidence suggests we are exposing patients to harm by inappropriately giving inhaled corticosteroids (increased risk of pneumonia). The NNT for inhaled corticosteroids is quoted as 44 to prevent 1 exacerbation over 3 years by Suissa et al. They propose a NNH (harm due to increased risk of pneumonia) of 20 for fluticasone-salmeterol. Dr Rizwan Kaiser updated us on the treatment of acute PE, focusing on weighing up risks and benefits of treatment dependant on risk stratification. He began by reminding us that mortality in acute PE is largely due to acute RV dysfunction. Outcome is dependant on clot burden and cardiovascular reserve. Risk stratification is based on the European Society of Cardiology Guidelines 2008. High risk are those that are haemodynamically unstable but this is less than 5% patients. There remains debate in how to risk stratify those who are intermediate risk. How should these patients be identified (ie which investigations or clinical markers are most reliable)? What is the optimal treatment for this group? Is there any benefit from thrombolysis? ECHO: Grifoni, Stefano, et al. “Short-term clinical outcome of patients with acute pulmonary embolism, normal blood pressure, and echocardiographic right ventricular dysfunction.” Circulation 101.24 (2000): 2817-2822. CT: Jiménez, David, et al. “Prognostic significance of multidetector CT in normotensive patients with pulmonary embolism: results of the protect study.”Thorax (2013): thoraxjnl-2012. RV: LV >0.9 indicates RV dysfunction. Troponin:Lankeit, Mareike, et al. “Highly sensitive troponin T assay in normotensive patients with acute pulmonary embolism.” European heart journal 31.15 (2010): 1836-1844. Meta-analysis: Becattini, Cecilia, Maria Cristina Vedovati, and Giancarlo Agnelli. “Prognostic value of troponins in acute pulmonary embolism a meta-analysis.” Circulation116.4 (2007): 427-433. Troponins have a low PPV but a high NPV. Clinical prognostic indicators include the PESI score: Moores, Lisa, et al. “Changes in PESI scores predict mortality in intermediate-risk patients with acute pulmonary embolism.” European Respiratory Journal41.2 (2013): 354-359. A combination of tests is better than any individual test ie: PESI + ECHO + USS Thrombolysis is effective in decreasing clot burden and reducing RV dysfunction acutely, but does this translate into better clinical outcomes short or long term? How should this be balanced against the risk of intracerebral haemorrhage? The evidence is limited. Kearon, Clive, et al. “Antithrombotic therapy for VTE disease: antithrombotic therapy and prevention of thrombosis: American College of Chest Physicians evidence-based clinical practice guidelines.” CHEST Journal 141.2_suppl (2012): e419S-e494S. Wan, Susan, et al. “Thrombolysis compared with heparin for the initial treatment of pulmonary embolism a meta-analysis of the randomized controlled trials.” Circulation 110.6 (2004): 744-749. Current guidelines are conflicting and vague, due to the paucity of evidence. ACCP 2012: advised in selected patients – who are they? We moved on to consider the most up to date evidence. Konstantinides, Stavros, et al. “Heparin plus alteplase compared with heparin alone in patients with submassive pulmonary embolism.” New England Journal of Medicine 347.15 (2002): 1143-1150. In this RCT there was no difference in mortality. However, there was lower than expected mortality in the heparin only group 2.2%. A number of reasons have been suggested for the lack of difference between the groups: low patient numbers so trial underpowered; patients in the trial did not truly have ‘submassive PE’; physicians were not in equipoise which may have affected recruitment; all studies allow for thrombolysis if patient becomes haemodynamically unstable, diluting the effect. Meyer, Guy, et al. “Fibrinolysis for patients with intermediate-risk pulmonary embolism.” New England Journal of Medicine 370.15 (2014): 1402-1411. The PEITHO study had a positive result for the composite end point of all cause mortality or haemodynamic collapse within 7 days, but not for the outcome of all cause mortality alone. There was only a 1.8% mortality in the heparin group. It was suggested that tenecteplase decreased deaths from PEs but increased deaths from bleeding ie haemorrhagic stroke. A subgroup analysis suggested that thrombolysis should only be offered to patients with intermediate risk PE who were under 75years old. Sharifi, Mohsen, et al. “Moderate pulmonary embolism treated with thrombolysis (from the “MOPETT” Trial).” The American journal of cardiology111.2 (2013): 273-277. Demedts, M., and U. Costabel. “ATS/ERS international multidisciplinary consensus classification of the idiopathic interstitial pneumonias.” European Respiratory Journal 19.5 (2002): 794-796. Some cases helped to illustrate presentation and diagnostic pathways. We then considered acute exacerbations of IPF and the difficulties in distinguishing exacerbation from infection. The challenge is that the treatments are different – antibiotics vs steroids. Acute lung injury is identified when there is PaO2:FiO2 <300, often with opacities, and a lack of LV failure. ALI (mortality 30-40%) vs AIP (mortality 70%) vs AEIPF (mortality 50%) may be difficult to distinguish. angina variant – narrowed coronary artery vessels leading to shortness of breath on exertion (rather than chest pain). Patient will have risk factors for IHD, and generally good LV function. They may describe a ‘walk-through’ distance such that they can push on through the breathlessness and continue to exert themselves. Diagnosis is by demonstration of ischaemia. An angiogram is required. Symptoms resolve with treatment eg PCI. 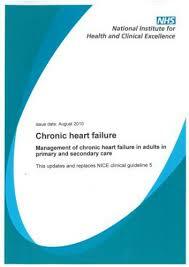 The NICE 2010 chronic heart failure, and 2014 acute heart failure guidelines were highlighted, including their reference to the critical role of the specialist, and the need for an integrated approach to care by an MDT. Audits show that the quality of care during the index admission dictate in hospital and subsequent mortality in heart failure. So the overall message from Dr Hardman was make a diagnosis of heart failure and it’s cause on objective measures, and refer to your local heart failure specialist for management. Diabetes – obesity is believed to account for 80-85% of the risk of developing type 2 diabetes, and research suggests that obese people are up to 80 times more likely to develop type 2 diabetes than those with BMI <22kg/m2. Obesity has significant effects on pulmonary mechanics. BMI correlates directly with the degree of airways resistance and work of breathing, and is inversely correlated with thoracic lung volumes. Reductions in FRC and ERV are associated with early airway closure and therefore gas trapping, causing VQ mismatching. Obesity leads to a restrictive defect due to the mass on the chest wall, with a reduction in chest wall compliance. Breathing at low lung volumes causes expiratory flow limitation due to early airway closure with generation of intrinsic PEEP. All these changes are exaggerated during sleep. Not all obese patients develop respiratory failure. Neural respiratory drive is important. Sleep disordered breathing includes OSA (recurrent rapid desaturations) and OHS (prolonged desaturations with prolonged periods of hypoxia – 30% of obese patients woth OSA have an element of OHS). There is no questionnaire that can easily screen for hypercapnia. The use of ABGs or CBGs may be inconvenient for large numbers, and in clinic/primary care settings. Helpfully, simple physiological tools of clinic SpO2 and FVC can be used to predict hypercapnia with high sensitivity, in patients with a BMI>30kg/m2 and evidence of sleep disordered breathing, and therefore streamline assessment pathways. Following lunch (where there was a disappointing lack of meat-free options….) we heard from Sian Williams, IMPRESS Programme Manager, on a symptom-based approach to breathlessness. A summary of the work and links to the resources produced can be found on the IMPRESS site. The day closed with talks on the radiology of Respiratory disease, and breathlessness in asthma. Unfortunately I have no notes for these sessions, so if anyone would like to share theirs, get in touch.